Every year in January I always feel compelled to make resolutions, set goals, all the things they (whoever ‘they’ are) tell you should be done when a new year commences. I hate New Year’s resolutions! Why? Because they make me feel like a failure when I don’t keep them. I wrote about this last year. By the way, if you go back to read last year’s post you should know that I successfully completed Goal #1. It wasn’t all that hard to follow through on. Not one person offered me a free plane ticket – anywhere! Sad. So, I’m done with New Year’s resolutions. I know I’ve got goals. I don’t need to write them down so they can mock me later. Call me a rebel if you must but I’m just not going to do it anymore. I’ve got a new plan. Call it my plan for people who hate goal setting; except it’s not really mine. I could probably be famous had I actually been the one to think of this. A few days ago I was reading my friend Becca Groves’ blog. Well we’ve never actually met, but we do consider ourselves friends. It’s a long story and not really the point of this blog but suffice it to say, she really encouraged me in her blog about One Little Word.She talks about picking one little word for the year to focus on to remind you about your priorities and choices. One word I can do. In fact, so far, I’ve found it to be much more effective than setting goals.Maybe it’s because I can remember one word much more easily than a list of 15 goals.You’ve probably guessed by now what the word is that I chose for this year (that’s the problem with being so wordy before you get to the point. )Persistence is my word for 2011. 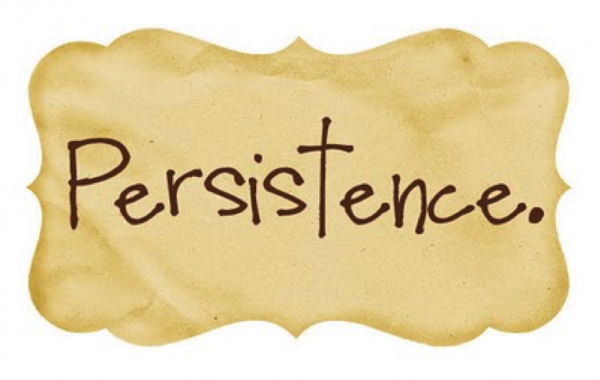 Persistence is a great word and would perfectly apply to my life in 2011.After picking my word I did a word search to see if the word persistence was anywhere in the Bible. It is! I found this verse in Romans 2:7, “To those who by persistence in doing good seek glory, honor, and immortality, He will give eternal life.” I’m all about having eternal life, but not only that, I want the best that God has for me right now and I suspect that persistently seeking the dreams and ideas He’s instilled in me might be just the ticket. The great thing about having one word is the way it pops into your mind all the time.For instance, the other day I was at the movie and really wanted a Coke to go with my popcorn.Coke, however is not on the list of prescribed “foods that will help me feel good” so I just thought to myself “Persistence Nancy,” and ordered water instead. (This could get annoying. )I’m not going to pretend that this will always work but it did that day.Baby steps. I also found this quote on persistence from James Whitcomb Riley. It seems to sum it all up. “The most essential factor is persistence – the determination never to allow your energy or enthusiasm to be dampened by the discouragement that must inevitably come.” Isn’t that a great quote? It doesn’t say discouragement might come, it says it MUST! While I’d prefer not to ever be discouraged, I’m fairly certain that’s not going to happen. So, this year, I’m going to be persistent in seeking God and His best for my life.I’m going to be persistent in working towards the goals that may not be written down but are most definitely in my head.I am going to be persistent! What about you? Would you like to join me with your own word? Click here for a list of words you might want to choose from. It’s by no means exhaustive. If you do choose a word, leave me a comment and let me know what it is, and why you chose it if you’d like. Whatever it is, I pray you’ll experience God’s very best for your life in 2011. Before I close I’d like to offer some kudos to Becca Groves.She created the little word frame at the top of this blog. That girl has a whole lot of creativity in her!Thanks Becca! This entry was posted in My Everyday Life and tagged God, Persistence, Word of the Year on January 11, 2011 by Nancy. Perserverance has always been my word. It reminds that if I could survive my childhood, God has great things planned for me.